This is an Insert MATTE BLACK new inside a carton, strapped to a skid, and sold with a WARRANTY and an Operator's Manual. 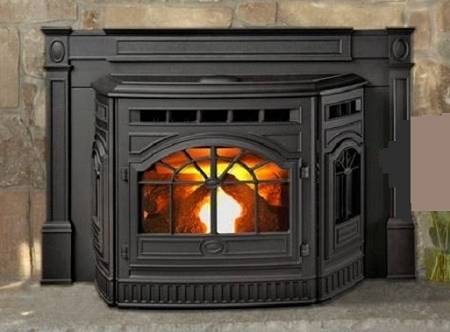 It is called the VINTAGE CAST IRON MULTIFUEL INSERT and will burn wood pellets and corn. It contains a beautiful cross-bar, cast-iron, door frame, palladian windows, colonial design. The unit being sold is MATTE BLACK in color, the second picture. The first picture is the Porcelain Mahogany Insert and it is $450 more as an addon option. The frame is an Antique Replica of victorian times and the inside components are high technology design to burn wood pellets and any kind of biomass material. The frame was made in Europe using premium quality steel to replicate the renown colonial American look of crossing bar patterns with a curved arch window (palladian). They are shipped to our manufacturing facility in the U.S. where they are meticulously assembled, combining their unique beauty with the highest American techology made. Note: the picture includes Porcelain Mahogany finish which is extra; listing being sold is Matte Black. The PORCELAIN Mahogany is a true authentic glass porcelain. Our high quality construction results in a limited lifetime warranty for as long as you own your stove (furnace). Load up our 45 lb hopper bin and burn up to 35,000 BTU/Hr to heat up to1500 to 2000 Sq. Ft. The manufacturer's recommended retail selling price MRSP is $3,595.00. We normally sell NEW, but ask if we have a DEMO, and/or USED stoves. All units are sold with a Warranty. The NEW units are also inside a carton, strapped to a skid, never operned. Supplies are limited. There are only a few left in the warehouse for this heating season. They are new sealed in a carton strapped to a skid. It is still wise to buy one now and get it installed and in place this Winter so you don't miss any cold winter months ahead. Ebay Rules allow the highest bidder to Buy-It-Now immediately with an early auction ending. There has to be more than 12 hours left in the listing. To do that call us at 1-319-298-0500 or contact us at Ebay's Ask-a-question located at the bottom of this listing in the far lower left-hand side or use Ebay's Contact Seller. This is consistent with Ebay rules and we have no intent to bypass them or bypass Ebay in a sale. Highlight features are: it will burn corn, wood pellets, sunflower seeds, wheat, any bio-mass, cast iron historic design flair, self lighting and fully automatic, thermostatic control, herringbone brick interior, aluminum heat exchanger, jam-proof feed system, easy firepot cleaning and ash dump, limited lifetime warranty, power outage modules (1000 watts), mobile home approved. It is built with the highest quality standards made. It has 35,000 BTU/Hr, 45 LB Hopper Bin, low 0.70 grams per hour emissons, Auto Ignition, and Semi-auto clean, durable cast-iron contruction, and a Limited Lifetime WARRANTY. The Matte Black unit is being sold in this auction, second picture. Porcelain Mahogany is extra as an Add-on Option. See the ADD-ON OPTIONS in a paragraph below. At a low particle emission rate of 0.70 grams/hr this unit meets or exceeds the EPA Certified Phase II Emissions Standards at 7.5 grams/hr for non-catalytic wood stoves and 4.1 grams/hr for catalytic wood stoves. It also meets or exceeds the strict CALIFORNIA Standards, COLORADO Phase III Approved, state of WASHINGTON Standards (less than 4.5 g/hr. ), and the strict OREGON Standards (less than 2.5 g/hr) for particle emissions. A Power-Outage Module (1000 watts) is available at $179 to supply 115 VAC to your crucial electrical devices ... a smart item to have as backup in power outages. Use this module for POWER OUTAGES and you can run it from any 12 VOLT BATTERY either a Car battery or a Deep Cycle Battery. It supplies 1000 WATTS of 115 VAC POWER with two outlets and battery cables are supplied. It will will run a variety of devices such as a CORN STOVES, WOOD PELLET STOVES , furnaces, computers, appliances, lights, sump pumps. It even has a USB Type A outlet that allows charging of IPOD's, Blackberrys, and Cell Phones. SIZE: 10 inches Wide, 5 inches High, 15 inches Long, WEIGHT: 15 lbs. Larger 1575 Watt POWER priced at $250, still Larger 2500 Watt POWER priced at $350. Worried about RISING fuel prices?...well don't worry. Just buy a MULT-FUEL stove, furnace, boiler, or fireplace insert and SWITCH to another (cheaper) fuel such as CORN, WOOD PELLETS or big HARD RED WINTER WHEAT ... or switch grass, or any BIO-MASS fuel of-the-future. The latest prices are posted in bags of sizes 40lb, 50lb, or 55lb where a bushel of corn is 55lb bag. BLUE SEAL STOVE CORN is in 40lb bags. Whole corn at a farm feed dealer is usually bagged in 50 bags. Only elevator grain (corn) is bagged in 55lb bushel bags. WOOD PELLETS come in a smaller bag (40 lb), and they burn less-hot than corn or other bio-mass material. First-time buyers (users) of corn stoves can feel comfortable about their purchase and installation because included is an installation DVD Video. It is included in the shipment. Width: 28-1/16" tapering down to 23-7/16"
Width: 28-1/4" tapering down to 23-7/16"
(Front part of the Insert sitting in front of fireplace mantel, the SURROUND hugs around the outside perimeter of it. Depth: 10-3/4", with Top Lid for Hopper sliding forward to allow the corn to be poured into it... so the top lid slides forward to enable this to happen. Basic Sheet Metal w Gold Bead: Width: 40" X Height 30" X Depth 2"
Small Cast Iron: Width: 42-1/2" X Height 30" X Depth 2"
Large Cast Iron: Width: 48" X Height 34" X Depth 2"
There is a lifetime warranty for as long as you own the product. You know the workmanship has to be superb to offer this. The LIFETIME WARRANTY covers the Main Frame, Heat Exchanger, Frame Housing, Legs, Door, Hinge, Glass in Door; 3 Years Fire Pot; and a 2 years Warranty on Electronics; and 5 years Labor Warranty. Be careful what you buy and from whom you buy. As a Dealer, if you elect, we can make a Warranty Claim, on your behalf as an option. We are a Dealer specializing in corn stoves and can help you through the installation as well as any on-going trouble shooting if necessary. Be careful as others may not have the capability to do that. Fresh air sources may be either a separate galvanized pipe shot up through the chimney or a straight horizontal shot from the back of the stove through the chimney wall.. A fresh air kit is especially recommended for newer contructed homes that have air-tight construction...as room air vacuum may be crated without it. Also inside air has impurities and is human-breathed, carbon dioxide saturated. Experience in the operation of Corn Stoves we recommend you: (1)Try to find local corn sources (farmers) with 12 to 14% moisture content from those who cater to corn stove owners; (2) Use crushed oyster shell with your corn and scatter or layer it into the hopper like layering soap in the laundry machine; (3) Learn how to run your corn stove with the least amount of air possible as too much air makes the stove run faster with waste, ash, and over heating; (4) High moisture content of corn 15% can be offset by burning crushed oyster shell and partial wood pellets; (5) Everyone should experiment with burning mixtures of wood pellets and corn. Your autolite feature will work better if you burn partial wood pellets. You should also experiment burning wheat. If corn prices soar, then you can switch to 100% wood pellets...or some other grain fuel like wheat. If you have experience burning it, then it will help. (6) Everyone should consider sprinkling crushed oyster shell into their corn to facilitate a cleaner burning and less ash. Included is our 50 page OWNER'S MANUAL with an installation VIDEO (DVD) with pictures that gives a wealth of information. We are the only ones that include a Video with the corn stove purchase. In the Owner's Manual is a step by step instruction for installation of a Chimney Exhaust Flue Vent Kit (not provided) and startup. A Chimney Exhaust Flue Vent Kit can be purchased separately at your request and/or check our Ebay Store. You should install a fresh air inlet and you should install it to not only avoid room air vacuum, but also control the amount of air fed into your stove. Customer can have it shipped by a commercial freight carrier 500 lbs to the nearest large-city Main Terminal serving the customer's geographic area. Customer can drive down to this Main Terminal in a pickup truck and they can load in there with a fork-lift truck. We estimate Freight delivered straight to Main Terminal to range between $215.00 to $315.00 and we will charge an average flat rate of $265.00 for the U.S. mainland. LIFTGATE Residential delivery is an add-on $195 with the LIFTGATE component $125 and the Residential component $70, the two added together making $195 add-on. Customer may pick this item up in person or have it shipped by a commercial freight carrier 400 lbs to the nearest large-city Main Terminal serving the customer's geographic area and the Customer will pickup the item at this large-city Main Terminal. We estimate Freight to range between $215.00 to $315.00 and we will charge an average flat rate of $265.00 for the U.S. mainland. Active bidders please provide me with your telephone number(s) and E-mail. This may increase your chance of getting the item in which you are bidding. Good communication exchange and successful bidding go hand-in-hand. Just a request and a suggestion. Heating capacity from 1500 to 2000 sq. ft., BTU output up to 35,000 BTU/Hr., Hopper capacity 45 lb, Fuel wood pellets or corn, EPA tested Particle Emission Rates were less than 0.70 grams/hour. Weight 350 lbs, Rear of the Stove Insert that sticks into opening: 28-1/16" wide X 19" high X 14" deep. The Outside Surround varies from 30"h X 40"w (plain panel), 30"h X 42-1/2" (small cast iron) up to 34"h X 48"w (large cast iron). Electrical 110 VAC, 3 Amps, 60 Cycles, Power Outage Module 1000 Watts option available, Safety Tested and Listed to ASTM-E 1509, ULC/ORD- C 1482, (UM) 84-HUD, and EPA Approved. 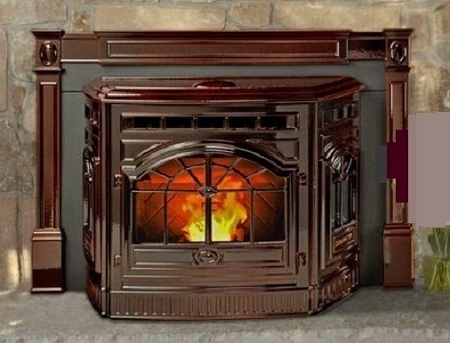 Manufacturer: American Home Hearth Company.